Originally a northerner, I now live in Kent (via Wales). This means I do a lot of travelling to catch up with scattered friends and family. Combine that with an obsession with books and bookshops, and it was inevitable I’d one day find an excuse to visit as many of them as possible, which is how I started writing my blog The Bookshop Around the Corner in my spare time. I’m basically on a one-woman crusade to remind people why they should be buying their books from real (preferably but not necessarily independent) bookshops on the high street. However rather than going on an angry rant I chose to do it in a positive way, sharing the bookshopping fun with anyone who wants to read. Also, I’ll only write about bookshops I like and have spent money in. You can find me on Twitter @bookshopblogger. If I like a book I keep it. All the books I own are on display somewhere in my flat – mostly on the shelves in my living room, but also in other strategic points, such as the kitchen, next to the bath or in piles on my dining table (waiting for me to tidy up the shelves, a regular problem given how many books I buy). The only ones hidden away are my old Open University course books. It felt a bit pretentious to have them on show. 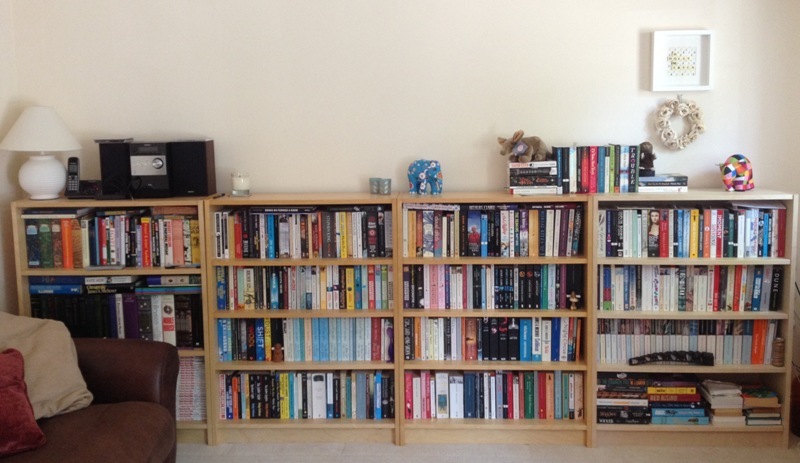 My shelves are split into three groups: standard paperbacks; misc; bookshop blog. Standard paperbacks is fairly obvious, this is an A-Z of the paperback fiction and non-fiction of my life. However last year I downsized from a house and had to cull around five boxes of books. This section took quite a hit, mostly classics from school (in the hope someone else will fall in love with them) unread university course books (the heavier side of studying English literature) and those I’ve inherited, but I agonised over every volume before putting it into the box. In the end the only reason I was able to give them up was because I knew how much the bookshop they went to would benefit. This section takes up the bottom three rows of shelves and includes the random oversized books on the right of the main picture. Misc is a combination of hardbacks, larger books and my childhood Sweet Valley High collection. It’s generally in alphabetical order according to size and also took a bit of a hit during last year’s enforced cull. Some of the books that mean the most to me are found in this section. This is the bookcase to the left of the main picture. The third grouping is for the bookshop blog. It takes up the top row of the bookcases and also on top of them. Given how obsessed I can be with alphabetical order, these shelves are the ones that make people look twice: the books are arranged in chronological bookshop order. The first book, The Princess Bride was bought at the first bookshop I wrote about, Big Green Books in Wood Green, London. 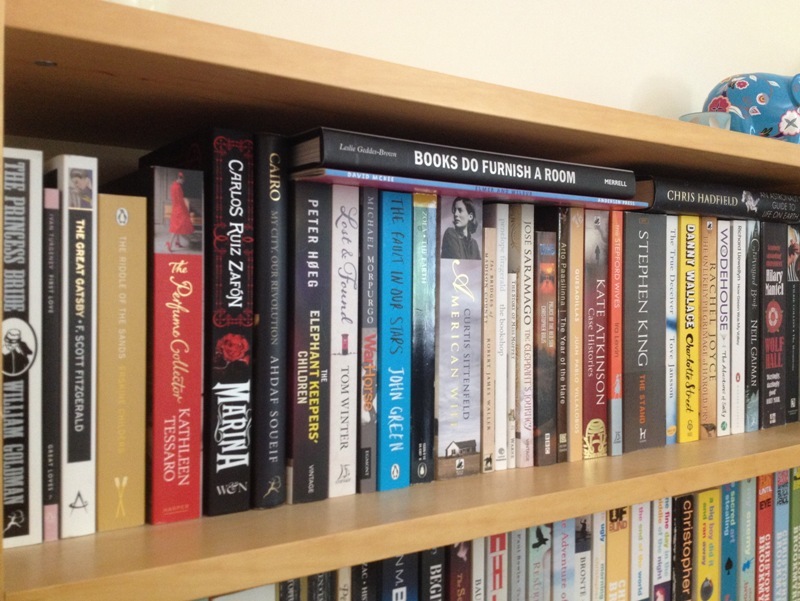 Then they follow in order, spilling out onto the top of the bookcases as I’ve run out of room. Next to these, acting as bookends and topped with random other bookshop items, are small piles of books relating to bookshops I’ve not yet written about. This is my favourite section and I’m never culling from it, the books are too great a reminder of all the fascinating places I’ve visited and people I’ve met since starting the blog. Nothing beats looking along a row of books for inspiring good memories. 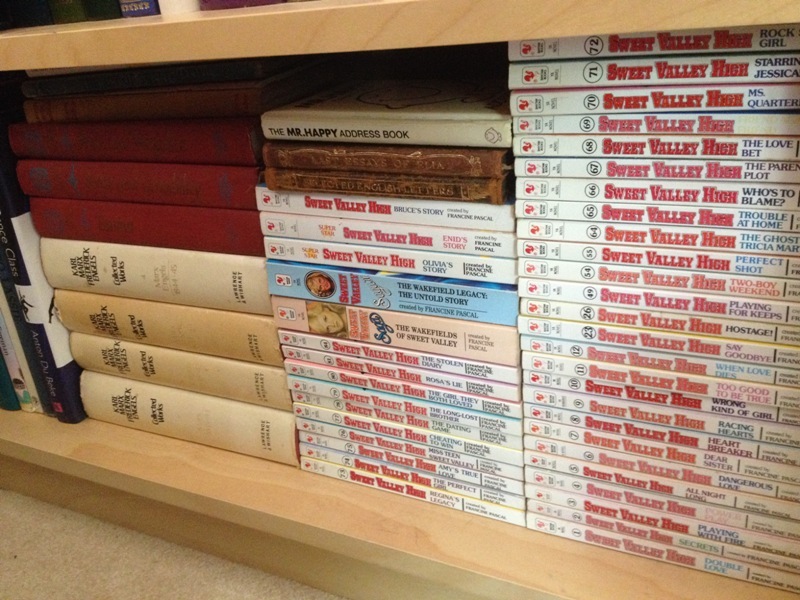 This was probably one of my Sweet Valley High books, I couldn’t tell you which one, but they are all proudly on display on the bookshelves in my living room. There should be nothing guilty about a book. Whether you’re reading Ladybirds, 50 Shades of Grey or Shakespeare, the simple act of reading is something to be proud of. Which is why in my A-Z shelves Dune sits next to The Iliad, and Stephenie Meyer’s spines are just as obvious as John Irving’s or Iris Murdoch’s. I’m guessing I’m not allowed to keep all the books from the bookshop blog? 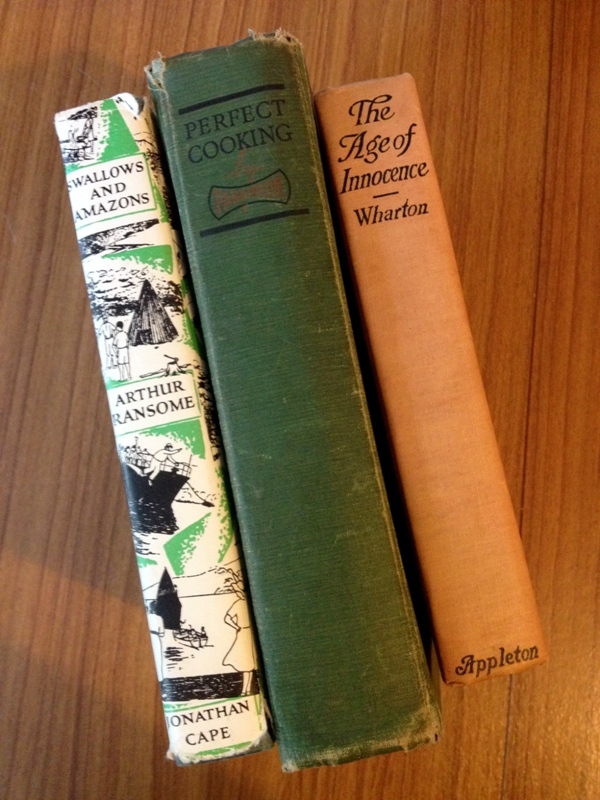 Instead I’ll pick out a couple of special ones: My first edition of The Age of Innocence by Edith Wharton, it’s my favourite book and was given to me be someone who’s had a big impact on my life; Perfect Cooking by Parkinson, my great-grandmother’s cookbook, including her notes along the side of the recipes; and Swallows and Amazons by Arthur Ransome, which taught me not to judge a book by its cover. There weren’t many books in my parents’ house, so holidays at my Gran’s generally led to me coveting her shelves. The simple fact she had books meant I coveted all of them. When I was finally allowed to start reading them her Jeffrey Archer collection came first, probably First Among Equals. Then I moved on to Jane Austen and Iris Murdoch. The first developed my fascination with politics, the latter two with reading. I’ve kept the latter two books. My TBR pile is so large I try not to borrow books! When I can I take part in a bookshare but I use this as an opportunity to read books I’d not normally go for. 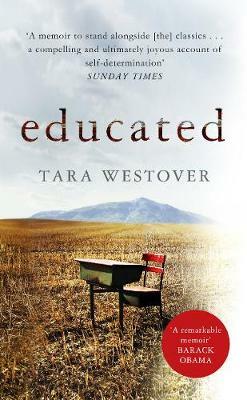 So far, this has inspired me to buy more of the other books by the authors I’ve been introduced to. Having said that, I am still on the lookout for a copy of We by Yevgeny Zamyatin, which I borrowed from my university’s library more than a decade ago. I’d love to re-read it and add it to my shelves. The Guest Cat by Takashi Hiraide, bought at The Kennington Bookshop. I’d actually intended to buy a different book, but another browser beat me to it (it’s all on the blog). I have an ambition to own and read all the Swallows and Amazons books by Arthur Ransome. I once found a complete set of first editions (in Stephen Foster Books, Chiswick ) and seriously considered blowing my salary on the lot until reason kicked in. Instead I’m on the look out to buy them one at a time in order, in whatever format I encounter them. Swallowdale, the second in the series, is proving surprisingly difficult to find. I’m also always on the hunt for more titles by Elizabeth Gaskell and Edith Wharton. I’ve no idea what anyone would think of my shelves. The best compliment anyone looking at my bookshelves could pay me would be to think my bookshelves look accessible, varied and interesting – and ask to borrow something. 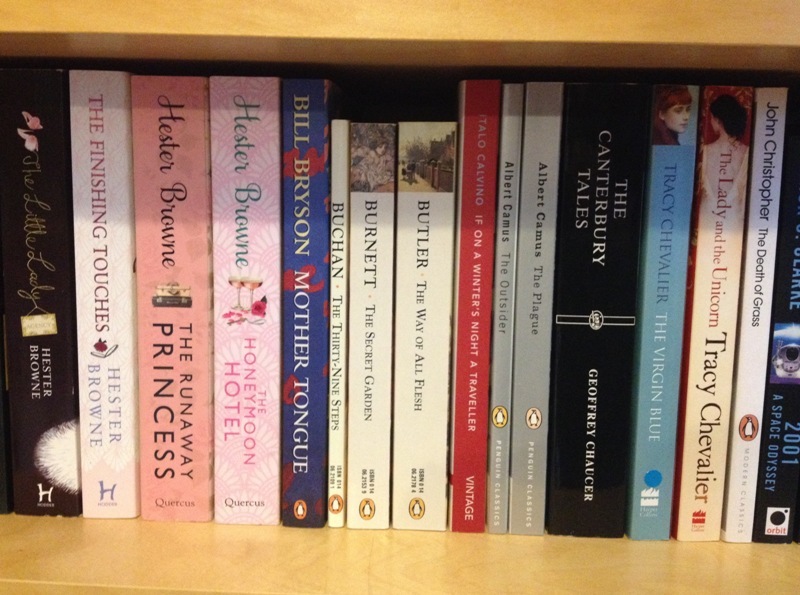 A huge thanks to Erica for taking part in Other People’s Bookshelves! If you would like to catch up with the other posts in the series of Other People’s Bookshelves have a gander here. Don’t forget if you would like to participate (and I would love you to – hint, hint, hint as without you volunteering it doesn’t happen) in the series then drop me an email to savidgereads@gmail.com with the subject Other People’s Bookshelves, thanks in advance. In the meantime… what do you think of Erica’s responses and/or any of the books and authors that she mentions? Thank you Helen, I do hope you enjoy my blog. I’m glad I’m not the only SVH fan out there, I still dip into them on occasion for comfort reading! Thanks Jo. If it helps, my bookshelves are pretty much the only organised thing in my home! Oh, SVH! My sister and I read all of them when we were teenagers and still have quite a few. I re-read one occasionally and they are hilarious! I also love Arthur Ransome, and the lovely hardback editions. I’ve found some pretty old ones at book fairs, but sadly can’t afford the first editions. I still re-read them when I need comfort. Arthur Ransome’s ‘Swallows and Amazons’ are easy to acquire on-line, whether you want hardbacks complete with dust wrappers or any of the series of paperbacks. I’m a great reader and collector of his books, I still have some from childhood (50 years ago now), a couple of sets of the hardbacks and many examples of the paperbacks, even a few first editions. Most importantly I still read them on a regular basis (not just for comfort) they are so well written and have taught me many things, as Ransome was excellent at explaining things. Thanks for the suggestion Mike, but I don’t shop online! I understand why you might not (I work in IT) but these days that’s where most second-hand book dealers trade, We have a good one near us and he still has a shop, but he rarely opens!